It's easy to cook this Lent compliant traditional soup! Having survived the six strict weeks of Lent, Orthodox Christians are now running into the hardest challenge, Holy Week. This, however, does not mean you have to give up your favorite dishes; tweak them a little and they’ll pass the strict religious test. The Lenten period gives us a unique opportunity to combine spiritual and physical purgation with gastronomic experiments for which Russian cuisine is known. After all, it was St. Ambrose of Optina who said that it's not the food you eat that matters but the commandments you observe. We polled chefs at Moscow's leading restaurants to bring you Lenten versions of your favorite dishes, without losing their nutritional value. This thick mushroom stock goes well with game, fowl, fish, or dumplings. 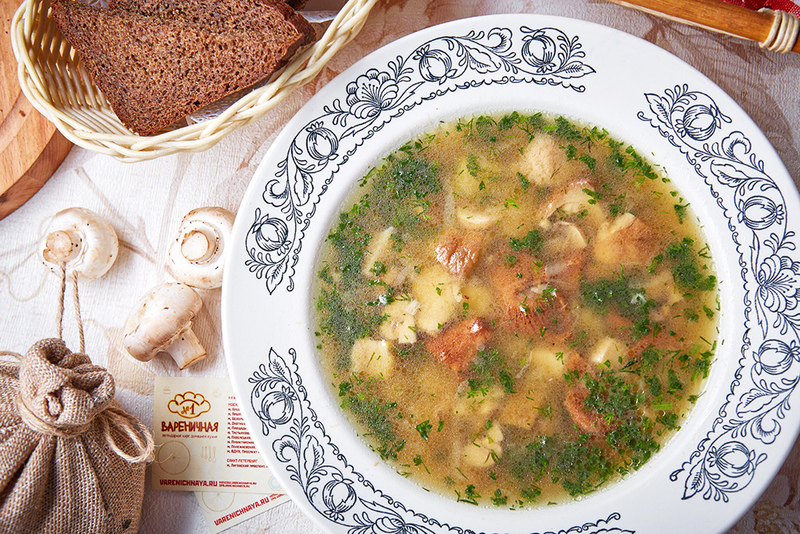 Alyona Solodovichenko, the chef of Varenichnaya No 1 cafeteria chain, shares her Lenten recipe for this soup. 1. You can use frozen mushrooms, just make sure you peel and wash them thoroughly before defrosting. Save whatever water is left and add to the soup as a natural taste booster. 2. Cube the mushrooms (if fresh, wash thoroughly and slice). Cube the potatoes and put them in cold water. Julienne the onions and coarse-grate the carrots. 3. Put part of the water into a pan and add whatever juice is left from the defrosted mushrooms. Bring to a boil, then add the porcini and girolle mushrooms. After the water has boiled again, lower the heat and simmer until the mushrooms are half-ready, skimming periodically. NB: The low heat will make sure your ingredients keep their shape, color, vitamins, and minerals. 4. While your mushrooms are cooking, sauté the onions and carrots. Add the portobello and potatoes to the pot. Wait up to 10 minutes and add the sautéed onions and carrots, then keep simmering. 5. Two to three minutes prior to taking the pot off the stove, add some allspice, garlic, and salt. If you add some soy sauce, it will give the soup a smoked aftertaste and extra aroma. Garnish with chopped fresh herbs and serve with rusks. Have you ever tried quasi-caviar? Well, now you have the chance! 1. Choose any juice you like: lemon, onion, or beetroot. 2. Mix it with the agar-agar and bring to a boil. 3. Fill a syringe with the resulting liquid and drop-feed it into the cooled olive oil. This unusual recipe is brought to us by Yevgeny Meshcheryakov, chef at Beluga restaurant. Beluga's menu contains any possible kind of caviar. Spherification (the culinary process of shaping a liquid into spheres which visually and texturally resemble caviar) of juices and other liquids is a known technique of molecular gastronomy. The technique itself was originally discovered by Unilever in the 1950s and later brought to so-called modernist cuisine, so this lenten recipe is the crossroad where modernist meets traditional. You can use any juice you like for making this caviar, we recommend you to try vegetable juice. 1. Crush the unpitted cherries together with the cinnamon and cloves. 2. Add flour and force-strain the mass. 3. Add the sugar, wine, and lemon juice and pour in cold boiled water. Leave to cool.